As the central California mountain range was getting bombarded with yet another significant snowstorm, the former Major League Baseball outfielder had little time to talk while enjoying every step in the early January powder, which was evident by the child-like thrill on the phone. Byrnes, 40, has an insatiable hunger for adventure, spending much of his time outdoors, doing a variety of activities. It wasn’t too long ago that the current MLB Network analyst spent the bulk of his time outside on the diamond, motoring around the bases and gunning opponents out at home plate. For 11 seasons, Byrnes put together a solid career, especially on the basepaths, tallying 129 stolen bases with five different franchises. In 2010, he elected to hang it up and transitioned to a broadcast career. But like so many athletes who spend significant time in professional sports, Byrnes wondered what was ahead. Having never routinely run a distance longer than the basepath, running didn’t seem like the logical choice, however Byrnes took a great amount of solace in the activity, much of which could stem from its ability to help with Byrnes’ Attention Deficit Hyperactivity Disorder. But what really began to fuel the ex-ballplayer’s passion was the triathlon, combining swimming and biking with running. 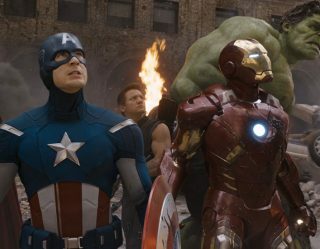 In a relatively short time, Byrnes had seven triathlons under his belt, at which point he attempted a marathon, followed by the Ironman triathlon – a 2.4-mile swim, a 112-mile bicycle ride and 26.22-mile run. Over the next several years, Byrnes continued to expand on his running capabilities, training and competing at the highest level, but it wasn’t enough. Byrnes decided it was time for a new adventure, perhaps the most challenging the sport has to offer – the 100-mile ultra-marathon. Byrnes didn’t pick just any ultra-marathon, he picked Western States, the world’s oldest 100-mile trail race – a true test of endurance. 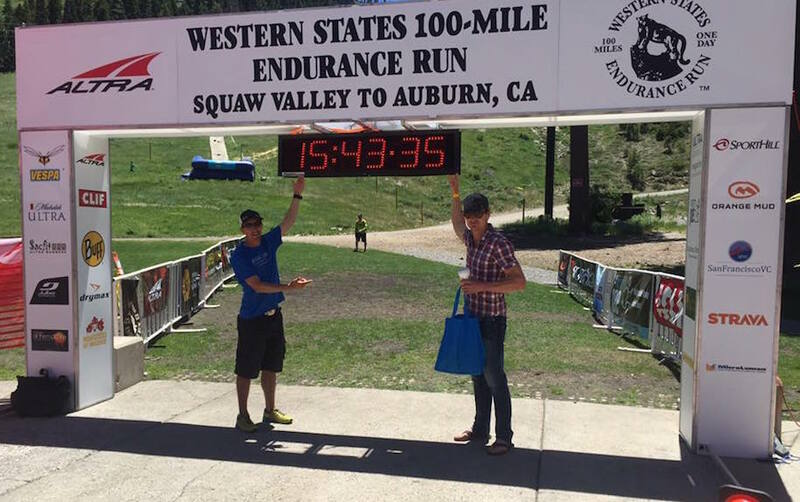 Starting in Squaw Valley, California – near the site of the 1960 Winter Olympics – and ending in Auburn, California, runners are forced to climb more than 18,000 feet and descend almost 23,000 feet during the competition, all while handling some treacherous terrain. There are coveted awards for conquering the race as well. A sub-30-hour finisher receives a bronze belt buckle, while a sub-24-hour finisher takes home the highly coveted silver belt buckle, ultra-running’s most coveted award. To enter the race, many of the participants must enter a lottery, and after being considered a long shot to be selected, Byrnes was selected. 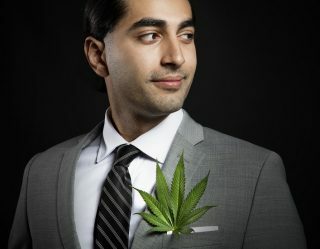 He had just one focus. It was during his training that the idea came to Byrnes to record his experience. But Byrnes didn’t want that to be just posting cell phone videos to social media or from photographs and video taken from his wife, Tarah, and friends along his journey – he wanted a keepsake. With just a few weeks before Western States, Byrnes was introduced to director Myles Smythe by a mutual friend at which point the idea was set into motion and Diamond To The Rough was born. Byrnes wasn’t sure if the project would turn into a documentary and figured, at the very least, he had a video for his kids. “More than anything, what I wanted was something for my kids to watch and maybe get some laughs at and understand that one of the main reasons why I was doing this was to set an example for them and for them to be able to go back and watch that – that’s all I cared about,” Byrnes recalled. 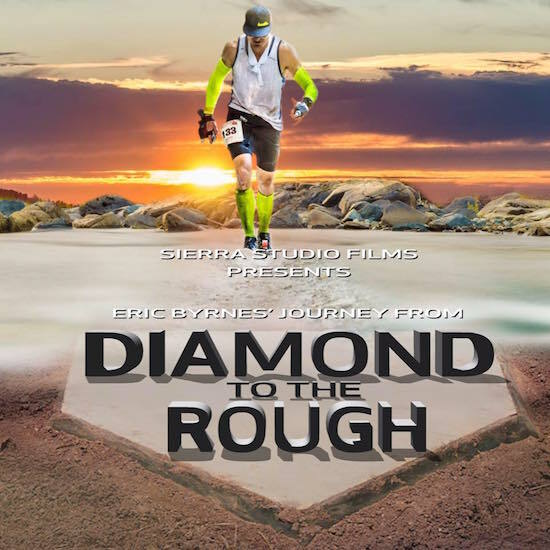 The 42-minute documentary follows Byrnes through both the training process and Western States, showing how the ex-ballplayer relies on the help of his family and friends to try and reach his goal. It offers a glimpse into just what endurance athletes must do in order to achieve greatness and it’s already won a handful of awards at several different film festivals since its release late last year. But it’s the film’s inspirational message that Byrnes is clearly proud of the most. Byrnes has received plenty of letters and messages on social media from his journey and there’s one in particuilar that stuck out. It was the story of an obese man who followed Byrnes’ baseball career and his love of running, which motivated him to get off the couch, eat better and exercise. After watching the documentary, the man admitted it changed his life and he’s since lost close to 150 pounds. It’s those kinds of reasons why Byrnes is glad he decided to follow through with the film. Byrnes wasn’t the only one dishing out inspiration, however. 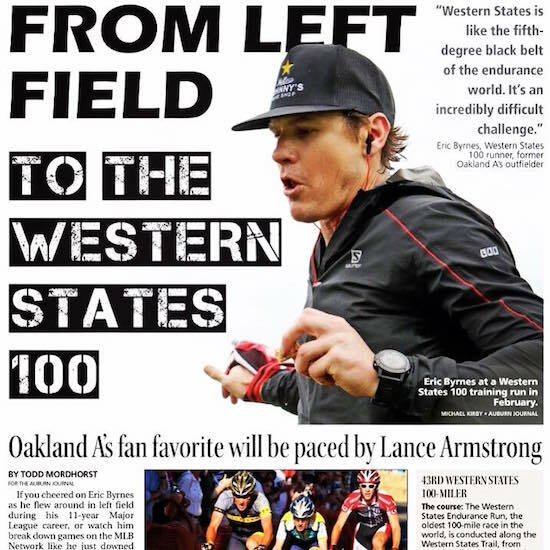 During his training, Byrnes made an unlikely friend, one that would be crucial to his success at Western States – that friend was controversial former United States cyclist Lance Armstrong. The two met on the golf course and, little did Byrnes know, Armstrong was also in the process of getting into ultra-running. Byrnes soon found out that the 45-year-old was in town for a race the following day and in no time, the two began to train together, pushing each other with friendly betting and conversation. Since then, both of the men have remained close, meeting up whenever they’re in the same area. Armstrong’s role in helping Byrnes achieve his goal cannot be overstated. He served as the pacer – one who runs with a person to help keep them on track and close to their time – for Byrnes. The two met at mile 60 and ran together until about mile 80 and Byrnes was pretty banged up when the two met, so having him there definitely helped lift his spirits and get him get through a difficult stretch of trail. But it was as much the mental support as it was the physical support, as Byrnes remembered. It’s not too difficult to spot Byrnes crossing the finish line at a race. 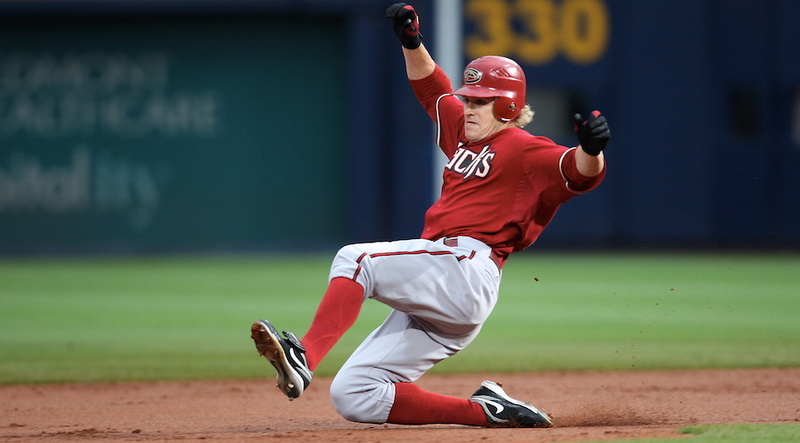 At every race, the former Arizona Diamondbacks player can be seen hoisting a No. 40 Arizona Cardinals National Football League jersey as he finishes. It’s a retired number most football fans know, that of former player Pat Tillman. Tillman, who walked away from an extensive contract to join the military, was killed in Afghanistan in 2004, in what later was discovered to be friendly fire. 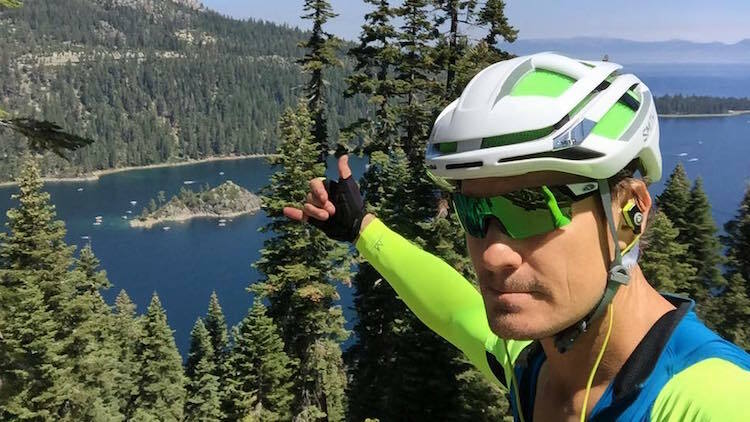 While Byrnes was a member of the Oakland Athletics during Tillman’s time in Arizona, the two were introduced by a mutual friend, who also played for the Arizona Cardinals, and immediately hit it off, given their similar love for adventure and life. 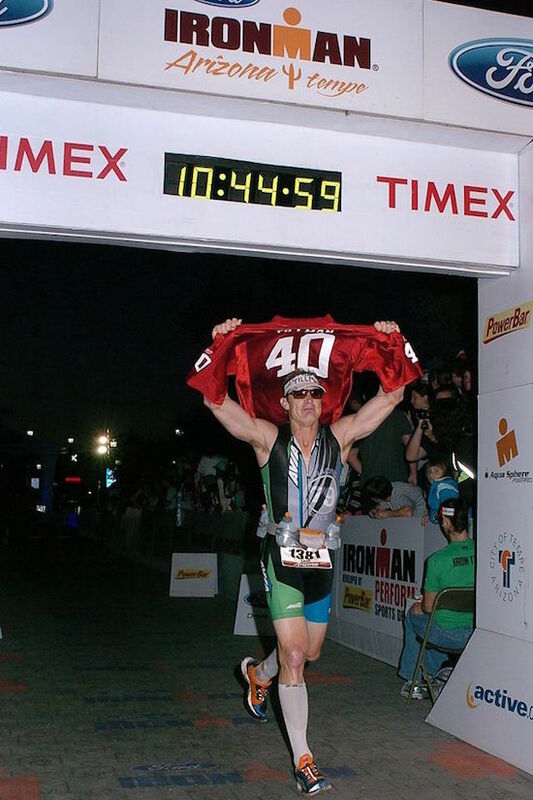 Byrnes hoisting Tillman’s jersey across the Ironman finish line in 2011. Byrnes hoists the jersey to continue to keep the memory of his fallen friend alive, in the hopes that it will further educate future generations on the impact Tillman has had to so many. While Tillman has been gone for more than 12 years now, it’s clear his words and actions still resonate with Byrnes all these years later, as he continues to find fulfillment in the next chapter of his life. “This dude was special and any chance I have to celebrate who he was as a person, as a football player, as a soldier like that, you know, that’s an awesome opportunity,” he said proudly. With the help of friends both new and old and the unwavering support from his wife, Tarah, it’s clear Byrnes has found a life after baseball, one that keeps him grounded, yet offers the opportunity to be an inspiration to those who might be looking to get more active. Running is clearly Byrnes’ newfound passion, but baseball will always be a part of him – even if it offers little for an ultra-runner. “I made a career out of running fast and now I’m in a sport where you can’t run fast. People always talk about what sort of translation is there between baseball and ultra running and, quite frankly, there’s not a whole lot at all. Ed Miller is a contributor for CraveOnline Sports, a movie quote extraordinaire and a proud Sun Devil. You can follow him on Twitter @PhillyEdMiller or “like” CraveOnline Sports on Facebook.